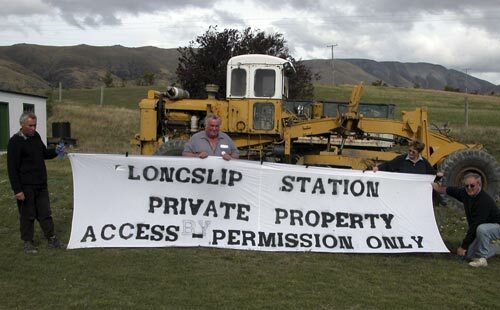 In the early 2000s ownership of, and access to, South Island high country land became controversial. While some objected to foreign ownership of areas of recreational value, some high country farmers took issue with Department of Conservation (DOC) control of newly acquired lands. Here Ōmarama farmer Peter Patterson (second from left) and his fellow protestors are blocking access to the Ahuriri Conservation Park on the morning it was to be opened. They objected to DOC preventing vehicle access to some areas by locking a gate 11 kilometres inside the park.